Lifted hatchbacks have become quite popular in the last few years, but their lofty suspension setups are usually good for no more than traversing pavements. Never one to shy away from the tough stuff, Subaru’s Crosstrek features not only permanent all-wheel drive, but massive ground clearance too, to deal with some pretty serious stuff. 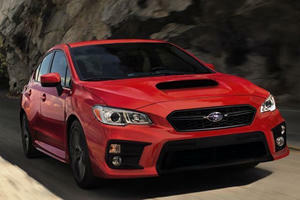 Based on the Impreza hatchback, appetizing driving dynamics and phenomenal safety ratings are a given, but being an Impreza hatchback on stilts also means that the Crosstrek falls short of the space found in bona-fide crossovers and SUVs. Even in the base model, the interior boasts a 6.5-inch touch screen with Apple CarPlay and Android auto, along with a multi-function driver’s display. The standard upholstery is cloth, though Premium models get leather seats with contrast orange stitching. Premium models also get a larger 8-inch touch screen, a 6-way power driver’s seat, and a leather steering wheel. 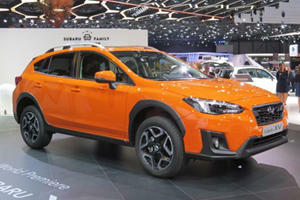 All in all, the new Crosstrek is vastly better than the old one – particularly from a design and quality standpoint. It now feels like a modern crossover in here and materials are suitably plush. There’s ample head and legroom for all occupants too, though shoulder width is perhaps a little compromised. Cargo space is very limited though – the downside to hatchback origins – with just 22.3 cubic feet of trunk volume lagging behind the likes of Honda’s CRV with 37.2. Drop the rear seats though, and the cargo volume swells to 51.9 cubic feet. With 8.7 inches of ground clearance, the Crosstrek has enough wheel travel to soak up just about any bumps on the road and off it. The suspension is supple and damping is great at filtering out smaller imperfections, though larger bumps in the road result in a bouncing motion as the suspension tries to soak it all in. Permanent all-wheel drive, a Subaru signature, makes the Crosstrek incredibly sure-footed in all weather conditions and on any surface, be it wet tarmac or dusty dirt paths, the Corsstrek feels at home. 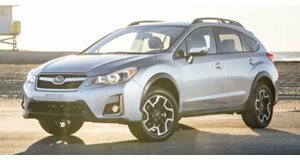 The tall suspension in a typical SUV would compromise handling, but the Crosstrek feels very similar to the Impreza – composed and agile – with only a small amount of extra body lean. 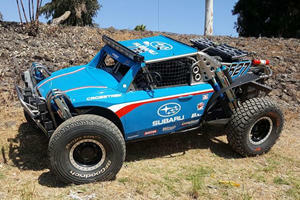 The electronic steering features more feedback than most systems do and it inspires confidence in a grippy front end. No matter the trim level, all wheel drive is standard and a non-negotiable. Also non-negotiable is a solitary source of propulsion – a 2.0-liter naturally aspirated flat four Boxer motor, with148 horsepower and 145 lb-ft of torque. A 6-speed manual is the standard, and better, of two transmissions, the other being a CVT that seemingly saps power and drones incessantly. Performance is sluggish all-round, with 0-60mph arriving closer to 10 seconds than it really should. But economy figures are impressive at 27/33 mpg city/highway with the CVT transmission, and 23/29 with the manual gearbox. Levels of kit in the Crosstrek aren’t massive in the base model, with only basic amenities arriving as standard. Choose a higher trim line (there are 3 to pick from – 2.0i, 2.0i Premium, and 2.0i Limited), and you get access to features like heated seats, keyless entry, automatic climate, and an optional sunroof. In terms of safety, few can beat the Crosstrek as an IIHS Top Safety Pick +, thanks to Subaru’s EyeSight Driver Assist Technology, that includes adaptive cruise control, pre-collision braking, and lane keep assist. The NHTSA also scored the Crosstrek highly – 5 out of 5 stars. It may be smaller than some competitor SUVs on the inside, but the Crosstrek is big on safety, big on comfort, and big on great driving dynamics. The 2.0i Premium is the sweet spot, and EyeSight is a must have bit of safety tech for the discerning buyer. One of Geneva's subtlest debuts could end up being the show's best-seller.